Model DLC-10C, with 254 nm Detector, Isocratic, pump flow 0.01-9.99 ml/min, 3500 psi, 7 mm Pathlength, 10µl Volume Flowcell, PEEK or Stainless Steel Construction. Can be converted to 280 nm or other appropriate wavelength. Model DLC-20S, Isocratic Variable Wavelength, 195-800 nm, with D2 (Deuterium) Lamp (195-360 nm; to 800 nm with optional W (Tungsten) lamp, 7 mm Pathlength, 10 µl volume analytical flowcell, pump flow 0.01-9.99 ml/min, 3500 psi. No Pressure transducer or display. PEEK or Stainless Steel Construction. Through-the-Handle valve. All stack versions of systems are available with alternative detectors (example: DLC-20S FL with fluorescence detector). Model DLC-20SP High Pressure Isocratic Variable Wavelength, 195-800 nm, with D2 (Deuterium) Lamp (195-360 nm; to 800 nm with optional W (Tungsten) lamp, 7 mm Pathlength, 10 µl volume analytical flowcell, pump flow 0.01-9.99 ml/min, 5000 psi. Includes pressure transducer and display. Stainless Steel Construction. Through-the-Handle valve. All stack versions of systems are available with alternative detectors (example: DLC-20SP FL with fluorescence detector). NOTE: Will control D-Star autosampler. Can not be upgraded to gradient. Model DLC-20S PLUS, Isocratic HPLC System with Variable Wavelength Detector for 195-800 nm Operation, 7 mm Pathlength, 10µl Volume Flowcell, Through-the-Handle Injection Valve (TtH) with Position Sensor, and Pressure Read-out Capability. Pump flow 0.01-9.99 ml/min, 3,500 psi Stainless Steel or PEEK Construction. Also includes: Star-Chrom LITE PLUS one channel data acquisition software and Calibration Module with wavelength and pump control (built into case). Includes D2 Lamp (195-360 nm; to 800 nm with optional W lamp), Accessory Kit and Power Cord. Requires User supplied computer. Minimum requirements: 166MHz Pentium Computer with One available COM Port (RS-232), Windows 98/XP or NT/2000 Operating System. All stack versions of systems are available with alternative detectors (example: DLC-20S FL PLUS with fluorescence detector). 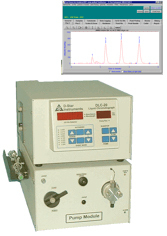 Model DIS-20S, Isocratic HPLC System with Variable Wavelength Detector for 195-800 nm Operation D2 Lamp (195-360 nm; to 800 nm with optional W lamp), 7 mm Pathlength, 10µl Volume Flowcell, Through-the-Handle Injection Valve (TtH) with Position Sensor, and Pressure Read-out Capability. Pump flow 0.01-9.99 ml/min, 3,500 psi. Stainless Steel Construction. 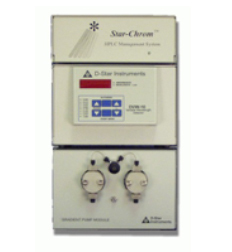 Also includes: Star-Chrom two channel data acquisition software and Calibration Module, with wavelength and pump control. Configured for 230VAC, 50/60Hz. Includes D2 Lamp, Accessory Kit and Power Cord. Requires User supplied computer. Minimum requirements: 166MHz Pentium Computer with One available COM Port (RS-232), Windows 98/XP or NT/2000 Operating System. All stack versions of systems are available with alternative detectors (example: DIS-20S FL with fluorescence detector). NOTE: Will control D-Star autosampler. May be upgraded to binary gradient with optional pump. 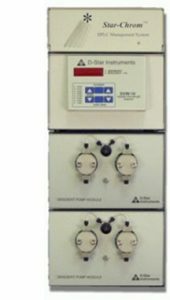 Model DIS-20SP, High Pressure Isocratic HPLC System with Variable Wavelength Detector for 195-800 nm Operation D2 Lamp (195-360 nm; to 800 nm with optional W lamp), 7mm Pathlength, 10 µl Analytical Flowcell, Through-the-Handle Injection Valve (TtH) with Position Sensor, and Pressure Read-out on front panel. Pump flow 0.01-9.99 ml/min, 5000 psi. Stainless Steel Construction. Also includes: Star-Chrom two channel data acquisition software and Calibration Module, with wavelength and pump control. Configured for 230VAC, 50/60Hz. Includes D2 Lamp, Accessory Kit and Power Cord. 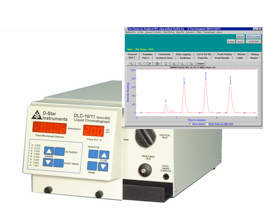 All stack versions of systems are available with alternative detectors (example: DIS-20SP FL with fluorescence detector). Model DGS-200 Automated Binary Gradient. Includes: Variable Wavelength Detector for 195-800 nm Operation D2 Lamp (195-360 nm; to 800 nm with optional W lamp) with Analytical Flowcell 7mm Pathlength 10µl volume; Model DPM-200 Gradient Pump Module with Pressure Transducer, Pump flow 0.01-9.99 ml/min, 3,500 psi., Through-the-Handle Injection Valve (TtH) with Position Sensor, and Star–Chrom HPLC Management Software and Accessories with Calibration Module. Stainless Steel or PEEK Construction. Requires minimum 166MHz Pentium Computer with One Free COM Port; Windows 98/XP or NT/2000 Operating System. Model DQS-200 Automated Quaternary Gradient with Variable Wavelength Detector for 195-800 nm Operation D2 Lamp (195-360 nm; to 800 nm with optional W lamp). Analytical Flowcell 7 mm Pathlength, 10µl volume. 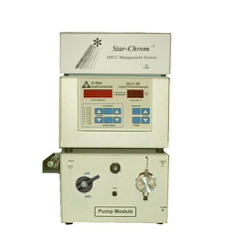 Includes two Model DPM-200 Gradient Pump Modules with pressure transducer, Through-the-Handle Injection Valve (TtH) with Position Sensor, and Star–Chrom HPLC Management Software and Accessories with Calibration Module. Column Accessory Module (CAM) includes: Through-the-Handle Injection Valve, Solvent Degasser, Column oven, PEEK or Stainless Steel Construction. 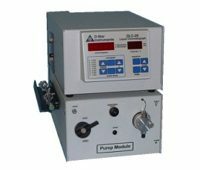 Pump flow 0.01-9.99 ml/min, 3,500 psi. Requires minimum 166MHz Pentium Computer with One Free COM Port; Windows 98/XP or NT/2000 Operating System. Model DQS-200P High Pressure Automated Quaternary Gradient with Variable Wavelength Detector. Pump flow 0.01-9.99 ml/min, 5000 psi.